A little under a week ago, the oddsmakers from Kambi installed a handful of 'Conqueror' betting markets that will see us through to - at most - 2019. These markets were similar to the Conqueror bets I covered last year where punters can place wagers on the time-frame when and the person who next defeats certain wrestlers. The current markets are specific to Braun Strowman, Daniel Bryan and Ronda Rousey. As mentioned earlier, they first went up last Sunday. I was able to note the prices but, with my focus on WrestleMania odds, I made the decision to wait until the next cycle to write about them. Kambi republished the markets yesterday. In this post, I'll write about all of these specials and note how the current odds differ from a week ago. Before I begin properly, I think it's important to note the rules. They're listed in the image below. The important bit is - For action, the match has to be a singles, advertised at least twenty-fours ahead of the result (unless it's a Money in the Bank cash-in) and the loss must be decided on pinfall, submission (includes passing out) or referee stoppage. 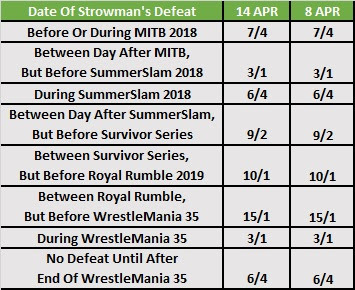 When it first went live, the options to bet on the time-frame when Braun Strowman suffers his next loss had 'SummerSlam 2018' and 'No Defeat Until After WrestleMania 35 Or Later' joint 6/4 favourites. The prices remain as they were back then. 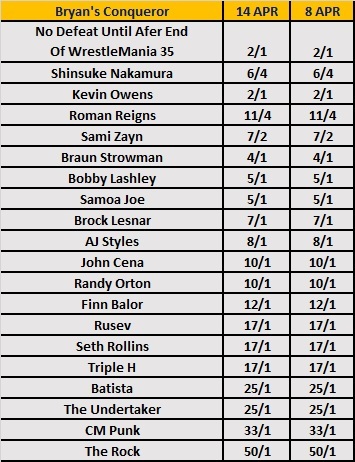 I believe the selection where you can bet on Strowman not suffering a loss until after WrestleMania is far too short. He's bound to lose a match by then. Unless, of course, if the plan is for Strowman to go on a reign of terror all the way to Mania. Even though the 'Date' market has been stationary, the one where customers can choose to back the individual who scores the next decision over Strowman in a singles match has had price fluctuations. The most notable shifts have been on AJ Styles (7/1 to 6/1), Triple H (12/1 to 10/1) and Randy Orton (20/1 to 15/1). Interestingly, two of the names - as of today - are on a different brand to Strowman. The other, Triple H, could still enter into a feud with Strowman as this was teased at the end of last year's Survivor Series. With that said, the right result - if Strowman were to ever square off against Triple H - should be for Strowman to go over. 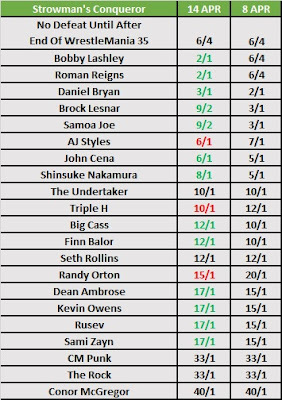 The second wrestler covered in these markets is Daniel Bryan, who made his in-ring return last week and - per this week's storyline - is back on the Smackdown roster. Unlike the Strowman time-frame market, the one for Daniel Bryan has changed since Sunday. The selections that have been cut are for Bryan to lose 'Between Day After Money in the Bank, But Before SummerSlam' and 'During SummerSlam'. The former has been cut from 5/1 into 4/1, while the latter was snipped from 2/1 into 6/4. 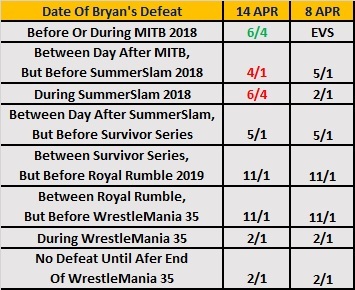 The market where customers can have bet on the person who next scores a decision over Bryan in a singles match hasn't changed since the market was first written up. 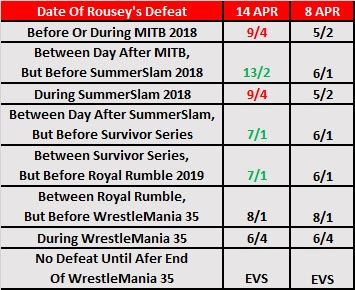 When the market - where customers can bet on the date of Ronda Rousey's next defeat - was published, the options to bet on 'Before Or During Money in the Bank' and 'During SummerSlam' were 5/2 each. They have since been cut to 9/4. 'No Defeat Until After End Of WrestleMania 35' is an even money favourite. It has stayed at this price. If done right - there's those famous words again - the only selections worth considering are the two at the bottom. Rousey should go on a undefeated streak for the entire year. Or longer! There have been six performers whose odds have been cut in the market where customers can bet on the opponent that delivers Rousey her loss. Charlotte Flair, who is rumoured to be Rousey's planned opponent for WrestleMania 35, has been cut from 9/4 into 5/4. Stephanie McMahon, who lost to Rousey at Mania and was then in an angle the following night where Rousey injured her again, has been halved from 4/1. 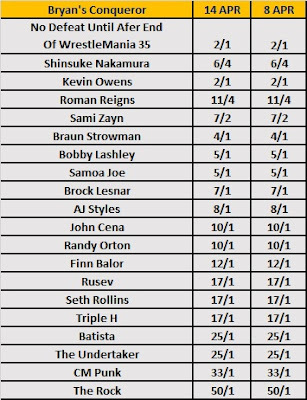 Ember Moon went from 25/1 to 10/1. I guess this is a byproduct of Moon being brought up to the main roster and being on the same brand as Rousey (I highly doubt either wrestler will move in next week's Superstar Shakeup). Other selections that have dropped are Sasha Banks (12/1 to 10/1), Mickie James (20/1 to 15/1) and Naomi (40/1 to 15/1). 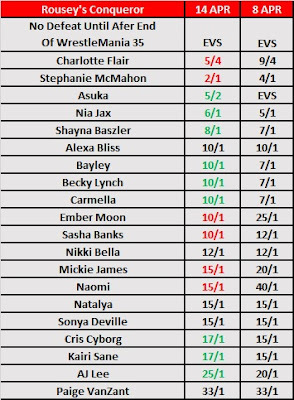 Of the selections that have drifted out the big story is last week's favourite, Asuka, now out at 5/2 following her loss to Charlotte Flair at WrestleMania. As per usual, I'll follow the markets and post regular updates along the way.